In the Atomic Age retro scene, there have always been folk with a taste for the gothic. You can thank The Cramps. One of the first punk acts to use the word “gothic” to promote themselves in the 1970s, The Cramps went on to influence what would eventually become the post-punk Goth scene. However, unlike Siouxsie and The Banshees, Bauhaus, and other Goth scene progenitors, The Cramps blended their horror movie flavored punk with rockabilly and surf rock from the 1950s and 60s, a style which would later be called Psychobilly. As a result of this unique sound, The Cramps had a diverse fan base that included Punks, Goths, and Lounge Revival’s retro scene cousins, the Rockabillies. The influence of The Cramps never really went away. As a result, there were always Goths with one foot in the Atomic Age. And there were always Rockabillies with Frankenstein tastes in their wardrobes and music. Your garden variety Goths even have a name for this: Goth-a-billy. Like The Cramps, the first Lounge Revivalists were Punks. It was they who rejected the commercialized grunge, hip-hop, and pop music of the 1990s. And it was they who were first buying vintage clothes and old exotica and space-age pop records at thrift stores. This is what influenced the first Lounge Revival bands to turn punk and other rock songs into ironic cocktail tunes. It’s telling that three of the founders of the seminal Lounge Revival band Combustible Edison were previously together in a punk band called Christmas. The short of it is this: The Lounge Revival scene, like Goth, is an off-shoot of the Punk scene that The Cramps originally inhabited. So it makes sense that the common element that produced both Goth and Lounge Revival could somehow produce a hybrid of the two — Lounge Gothic. It makes sense. Yet it never happened. Despite the diverse range of musical acts generated by the influence of The Cramps, the spook show aesthetic in music and fashion stayed firmly on the rock-n-roll side of the retro scene for decades. It’s not to say that people haven’t been thinking about the possibility of gothic lounge music. Goth musician Voltaire, in his 2005 amateur crafts book Paint It Black, reminisced about “Curse of The Hearse,” a Goth gathering featuring tropical drinks, death rock tunes, and Island of Lost Souls (1932) on the video screens at Otto’s Shrunken Head, a tiki lounge in New York City. He went on to suggest that, with enough skulls and implied cannibalism, Polynesian Pop could be as Goth as Peter Murphy on a Hawaiian vacation. Sure, Voltaire was kidding. But he was only half-kidding. After spending so much time as merely an idea, Lounge Gothic is finally beginning to coalesce as a music genre. And like the second-wave Goths who set aside death rock in the 1990s in favor of the introspective sounds of darkwave and ethereal, so too have some of today’s gothabilly/psychobilly acts set aside their usual sounds in favor of spookier forms of Atomic Age exotica and space-age pop. Unusually, this has happened under one roof: Dionysus Records. First, independent noir-jazz purveyors Jimmy Vargas and The Black Dahlias signed with Dionysus in 2012. Since his beginning in the 1990s, Vargas has always injected his music with the darkly supernatural and the occult. So it would be remiss not to mention him and his pioneering proto-Lounge-Gothic sound. Following the signing of Vargas came a side project from The Creepy Creeps: Creepxotica, a self-titled 7″ EP. Reworked and rerecorded tracks from this EP made their way on to a full-length release, Haunted Bossa Nova, in 2013. 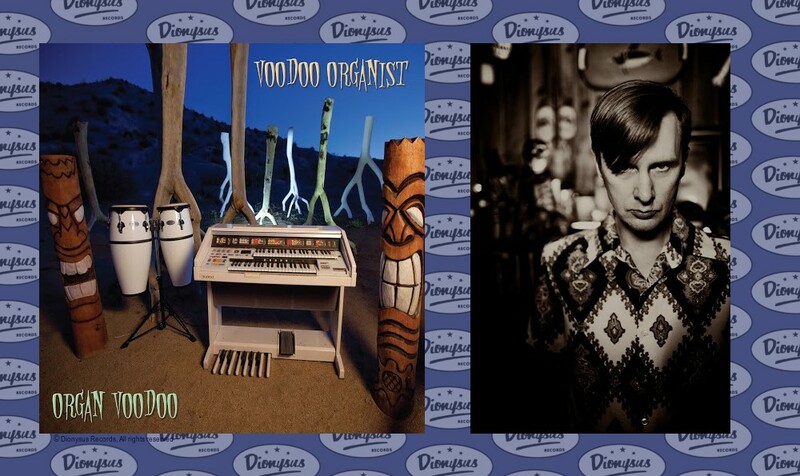 Today, confirming Lounge Gothic as a genre, is Organ Voodoo, the new album by The Voodoo Organist. The releases that would formally define the Lounge Gothic sound would be Creepxotica’s. Here The Creepy Creeps went instrumental, slowed down their tempos, and included vibraphone and the occasional sax in their usual surf rock orchestration. The Creepxotica sound, and Lounge Gothic, was complete with the addition of plenty of eerie echo and reverb — staples of both surf rock and second-wave Goth. The superb tracks “Bali Hai Bossa” and “Haunted Hula” from Haunted Bossa Nova stand out as exemplars of the new Lounge Gothic sound. Popular amongst Lounge Revivalists, the limited blue vinyl first pressing of Haunted Bossa Nova has sold out. A second limited pressing, on green vinyl, is planned; However, you can buy a digital download right now. Waiting for the new vinyl, though, ensures that you’ll have a framable copy of Creepxotica’s moody Leeteg-inspired album cover. Building upon and expanding the Lounge Gothic sound is Organ Voodoo. Although this is The Voodoo Organist’s ninth album overall, it’s his first vinyl release and his first for Dionysus Records. Additionally, it can be considered a first album in that, like Creepxotica, he has set aside the rock styles of his previous releases in order to explore a more mysterious flavor of instrumental exotica. “Dry Martinis and Wet Bikinis” and “It’s Smokey” round out the album with the Organist’s own brand of cocktail-noir. And “Desert Dream Scene” ends the album in a phantasmagorical stroll through the Mojave. Even so, this album is different enough from the Organist’s other releases that it may appeal more to those whose tastes run towards Lounge and cocktail jazz. As such, it’s a good entry point for those Lounge Revivalists new to The Voodoo Organist. As a person with artists like Esquivel! (lounge) and Lycia (goth) sharing space in my music collection, it’s not without care that I say that Lounge Gothic is a welcome innovation. Organ Voodoo is my favorite release of the year. It breaks the long-felt ennui I’ve had regarding music overall. And it’s the perfect answer to the terrific Haunted Bossa Nova of two years ago. I hope these artists continue to dig into the new Lounge Gothic sound they’ve established. And I hope inventive new artists engage with it. It would be a shame not to explore this eerie musical mystery any further. Swank Halloween parties demand more. Second pressing on green vinyl with digital download coupon coming soon. Limited edition of 500 on red vinyl with digital download coupon. Disclosure: Copies of the reviewed items were provided by the publisher to Ultra Swank’s reviewer free of charge. Album covers and photo of Scott Wexton (Voodoo Organist) are courtesy of Dionysus Records; Performance photos of Creepxotica are courtesy of The Creepy Creeps Facebook page.